Here is proof! Spring is working hard to make an appearance in my yard. I have a row of trees along the front of the property here. Under the trees I have planted hundreds of bulbs. Some have come to me as gifts from family members and friends, some I have purchased on sale at the end of the season or through a special offer from a bulb catalog. Each year the collection grows and I look forward to April to see which little faces pop up first! 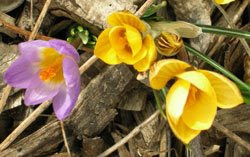 Here the crocus are coming up. There were quite a few today so I took some photos. The photos came out great in the afternoon sun, so I may use these as references for future paintings. This is probably my favorite time of year, or at least it seems that way after we experience a tough winter like this one was. I just love to see everything budding, developing color and coming back to life! Oh, happy spring!! !